Champaka nigra (Distant, 1888) is found in the Philipines. 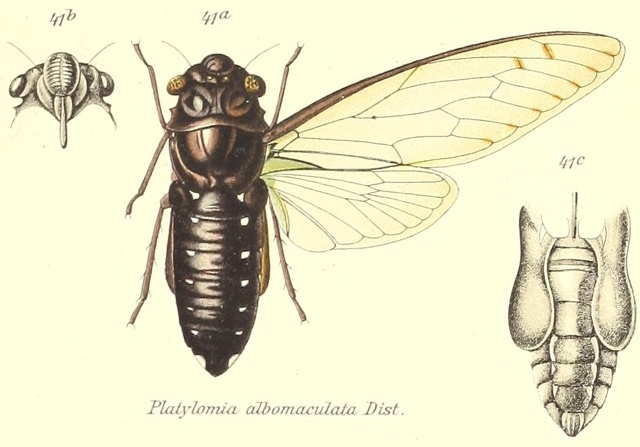 Back in 1913 Platylomia albomaculata and Platylomia nigra were regarded as two different species. (FYI, albomaculata means white spotted in Latin, and nigra means black or dark also in Latin.) Somewhere along the line it was determined that they’re the same species, and belong to the Champaka Distant, 1905 genus, thus Champaka nigra. The image says Platylomia albomaculata. but the new name of this cicada is Champaka nigra. Characters. — Head (including eyes) considerably broader than base of mesonotum, its length about equal to breadth between eyes, lateral margins of front and vertex almost obliquely in line; pronotum about as long as head, its lateral margins armed with a distinct medial spine ; mesonotum moderately tumid ; abdomen considerably longer than space between apex of head and base of cruciform elevation ; tympana covered, tympanal coverings broader than long; opercula short. just reaching basal abdominal segment, laterally oblique and thus exposing the marginal areas of the cavities rostrum reaching the posterior coxae; anterior femora strongly spined beneath ; tegmina and wings hyaline, the first considerably longer than the body and with its greatest breadth considerably less than a third of its length; apical areas eight; basal cell longer than broad.